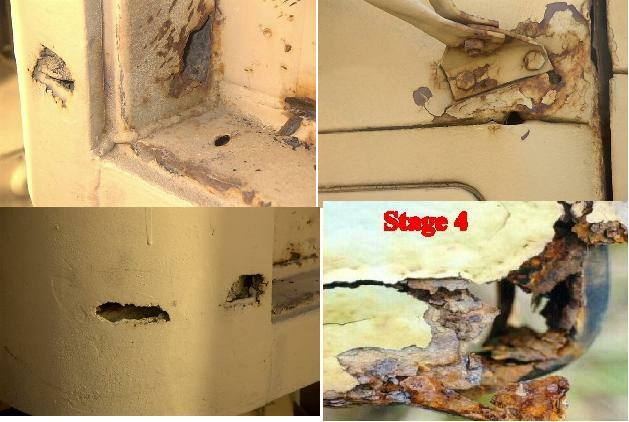 Generally, corrosion problem is measured or rated at 4 stages. The corrosion rating is on a scale of 0 to 4. 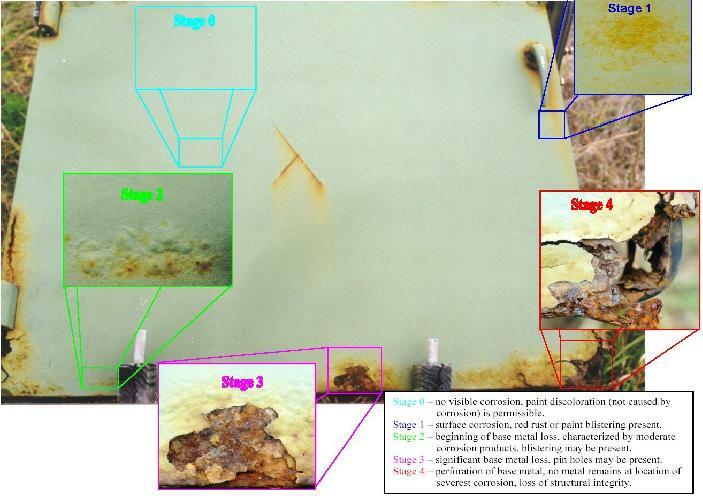 One must establish a consistency of assessing material corrosion conditions. This Stage/Scale system is designed to assist common folks in understanding of corrosion problems and establish corrective action required. The painted surface has shown no sign of cracking, bubbly or paint bubbles. There is no pitting, no etching and the surface shows no rust stain or trace of rust. Surface Coating is not comprised. At Stage/Scale 0, there are no corrective measures required. Remove corrosive agents such road salt. Remove contaminated agents such as dirt, grease, solvent and contaminated water etc. The painted surface is bubbly or the paint bubbles have broken to reveal rusty red, black, or white corrosion deposits on the metal surface. This may be accompanied by minor etching or pitting of the metal. No scale is present but the metal may have loose, powdery, or small granular deposits on the surface, base metal is sound. Surface coating has been comprised. Painted Surfaces: This condition does not require immediate corrective action; however. The surface should be cleaned and apply a corrosion control coating for preventing further corrosion. Interior Machine Surface (Both Functional and Non-Functional): This condition does not require immediate action other than re- processing as necessary. Exterior Machine Surface (Both Functional and Non-Functional): This condition does not require immediate corrective action other than re- processing as necessary. However, a corrosion control coating is recommended to control further corrosion. Notes: If the component is critical, replacement is needed. If surface is covered with dirt, grease, soil, mud or dust, cleaning. Powered granular or scaled condition exits on the surface metal. Rusty red, black or white corrosion deposits are present. Metal surface may be etched or pitted. Metal beneath the corroded area is still relatively sound. Painted Surfaces: Clean the surface by any applicable process. Apply Corrosion Control coating. Touch up with paint as originally applied. Interior Machine Surface (Both Functional and Non-Functional): Clean, exercise, and reprocess. 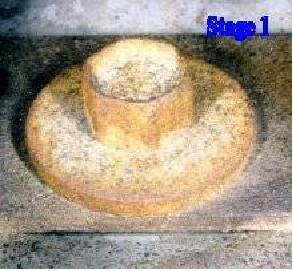 Exterior Machine Surface (Both Functional and Non-Functional): Clean, exercise, and reprocess. Apply corrosion control coating wherever required. Remarks: For machine or equipment where critical thickness is essential, apply a suitable corrosion control coating is a must. For electronic equipment and instruments, clean the surface by an applicable process and coat the surface with a suitable corrosion control coating that will not interfere the operation. 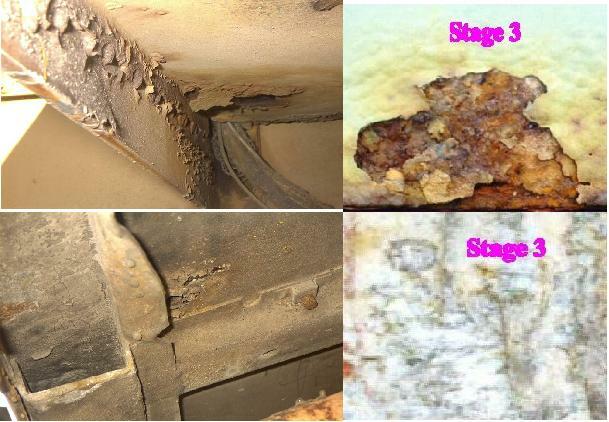 Surface conditions and corrosion deposits present are similar to Stage 2 except that metal in corroded area is unsound and small pin holes may be present. 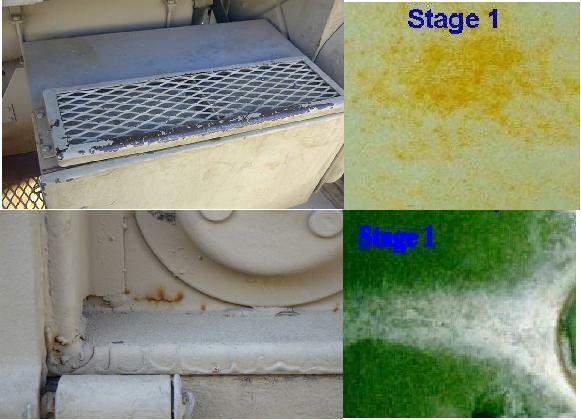 Rust, black or white corrosion accompanied singularly or in – combination with etching, pitting, or – more extensive surface damage. Painted Surfaces: Corrective action is required immediately. Clean the surface by any applicable process. Repair the damaged surface. It may require to replace the damaged parts. Apply a suitable corrosion control coating to cover the entire surface . Top coat with paint as originally applied. Interior Machine Surface (Both Functional and Non-Functional): Clean, exercise, and reprocess. Apply a proper oil based corrosion control product to prevent further corrosion. Remarks: At this stage the function or fitness of the equipment will be affected. Immediately corrective action is required. Remove the rust, clean the surface properly and apply a suitable corrosion control coating. For machine or equipment where critical thickness is essential apply a suitable corrosion control coating is a must. 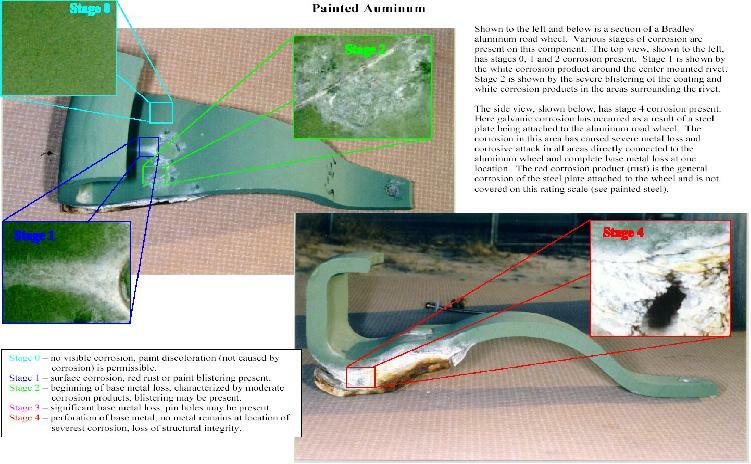 Corrosion has advanced to the point where the metal has been penetrated throughout. 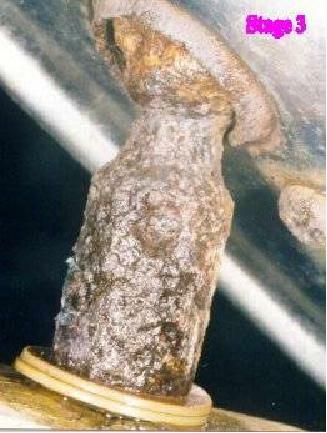 No metal remains at the point of the most severe corrosion. There are holes in the surface area or metal is completely missing along the edges. Painted Surfaces: Corrective action is required immediately. Clean the surface by any applicable process. Replace the damaged surface. Apply a suitable corrosion control coating to cover the entire surface . Top coat with paint as originally applied. Remarks: At this stage the function or fitness of the equipment will be comprised or greatly affected. Safety of the operator is at risk. For machine or equipment where critical thickness is essential apply a suitable corrosion control coating is a must. Replacing the parts or components are generally recommended. Stage/Scale 0: The stainless steel is in good condition, no pits and the protective Cr film is intact. Preservation and passivation is required to maintain the protective Cr film. 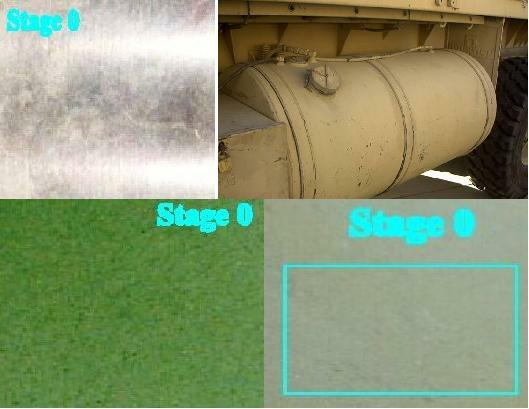 Stage/Scale 1: The stainless steel has shown sign of early stage of pitting corrosion problem. The protective Cr film has been comprised. Flash Rust stain is also easily seen. The metal is sound. Protective Cr film is comprised. Stage/Scale 2: The stainless steel has advance to Stage 2 of corrosion. 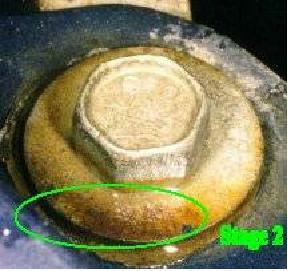 Small pits are developed on more than 60% of the surface and flash rust stains are easily seen. The metal is still sound. The protective Cr film is comprised and flaking is spreading but still visible. 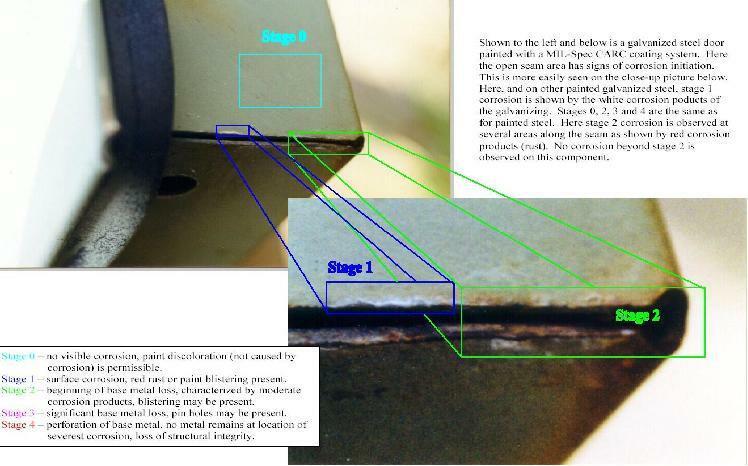 Stage/Scale 3: The stainless steel has suffered a severe pitting corrosion problem. Because the pits are closed together, a uniform corrosion will likely develop and core diameter is severely reduced. It can be up to 30% reduction. 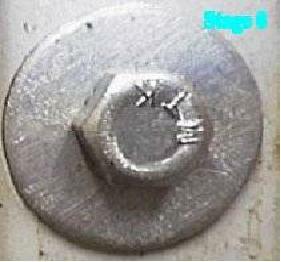 Depending on the purpose of the stainless steel, the strength of the stainless steel may have reached a critical stage where further investigation is required. The protective Cr film is nearly disappeared. 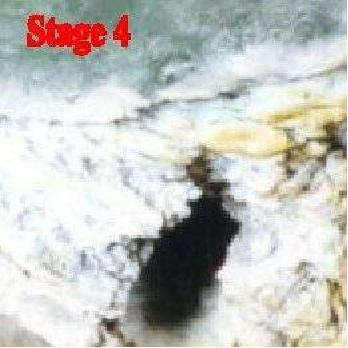 Stage/Scale 4: The stainless steel has suffered severe pitting corrosion problem. 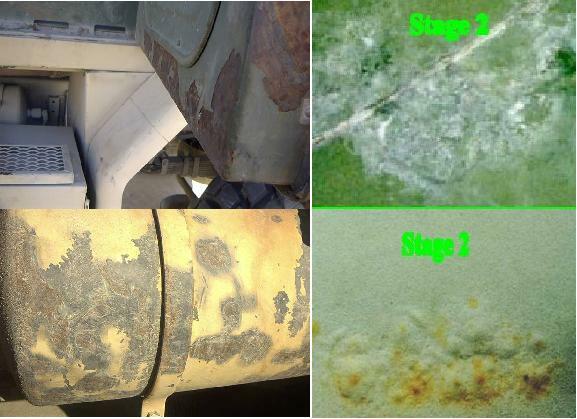 Although the general surface area appeared to be better than it shows in picture B, the severe side pitting corrosion problems are hidden beneath the surface. 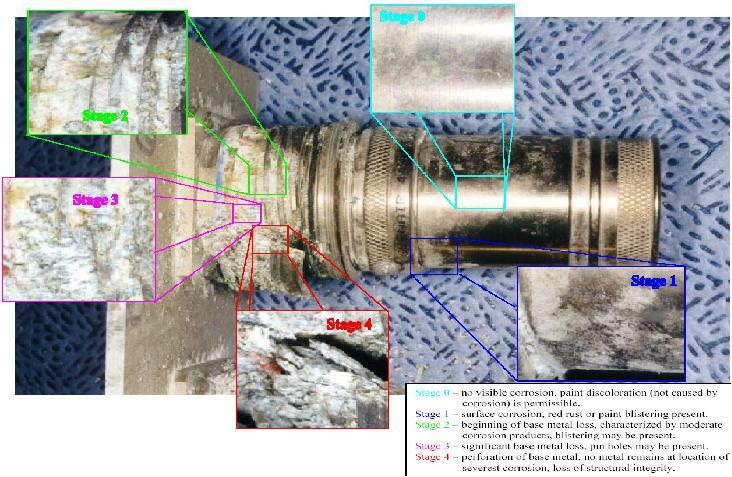 (a poor repair job was done after Stage 3 was observed).